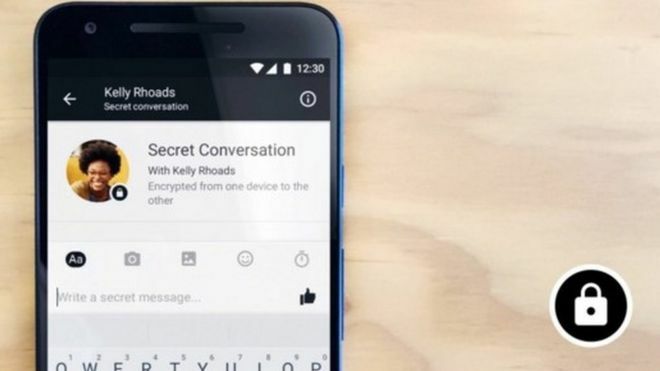 Facebook tests ´secret message´ service. Private messages that can disappear are being trialled by Facebook as it experiments with a new option for those using its Messenger app. They become hidden after a certain period of time chosen by the author, the firm said. It is part of a new "secret message" service having a limited trial, Facebook announced. Senders must choose one device to use it on, as messages sent this way are stored on the device itself. Those flagged to "disappear" will be deleted from the device as well. "Starting a secret conversation with someone is optional," it said. "Secret conversations can only be read on one device and we recognise that experience may not be right for everyone." Facebook listed health and financial issues as examples of messages that people may wish to keep more private - while others have mentioned love affairs. The idea is being trialled on a "limited basis", Facebook said, but added that it would be more widely available over the summer. Video and GIFs cannot be shared secretly at the moment. The service will also have extra features for reporting abuse - and once this is introduced, there will be a delay in the deletion of messages to enable flagging. "Facebook will never have access to plain text messages unless one participant in a secret conversation voluntarily reports the conversation," it explained in a technical document. The service is built on the Signal protocol by Open Whisper Systems, which is widely used by messaging apps, said cybersecurity expert Professor Alan Woodward from Surrey University. "Signal is well tested and those who developed it are well regarded in the cryptography community," he said. "But the problem with something effectively becoming an open standard in this way is that if ever a problem were found it could have widespread impact." Prof Woodward added that the technical report released by Facebook was "not as complete as many would like" in terms of assessing the service's security. "If I were to choose any messaging system I would look for it to be based on Signal at present. "However, I'd like to know more about exactly how it is implemented, or at least know that those who can analyse such systems have scrutinised the code." Find out more about our featured Business of the Week - Viajes Canals. HELP Euro Weekly News to HELP promote YOUR business. EWNGETSIT.com is the newest and brightest professional online business directory for any business based in Spain. Not only does this Spanish business directory attract clients to you, it is backed up by the power of the Euro Weekly News media group. EuroWeeklyNews, Spain´s biggest English newspaper, with six newspapers read by half a million people every week; together with the EuroWeeklyNews website packed full of Spanish news, point directly to this site, guaranteeing plenty of online interest for our clients. We offer flexibility and can tailor listings to individual business needs. You may enter your business into several categories to increase your business opportunities. We offer ongoing support ensuring you are always in control of the information in the listings for an annual fixed fee. Professional business listing service by EWN Group. To make sure your business is listed into the best business directory Spain, and guarantee top search engine results, please contact us for more information.